On or about this date in 1945, three women who had been caught behind German lines working for the British Special Operations Executive were shot at Ravensbruck. Left to right: Denise Bloch, Lilian Rolfe, Violette Szabo. 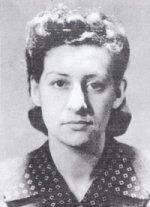 Denise Bloch, Lilian Rolfe, and Violette Szabo were all fluent young Francophones who volunteered their services for Britain’s dangerous spying-and-sabotage operations in support of the French Resistance. 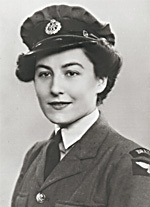 Bloch and Rolfe were wireless operators; Szabo, the most famous of the three, got her hands dirtier with explosives and sabotage. All three were very brave, and I was deeply moved. 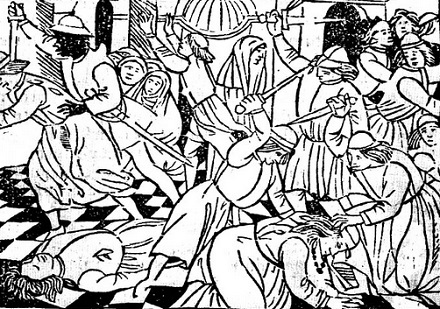 Suhren was also impressed by the bearing of these women. He was annoyed that the Gestapo did not themselves carry out these shootings. Extensive and illustrated biographies on all three, as well as other SOE agents, can be found at 64 Baker Street: Bloch; Rolfe; Szabo. 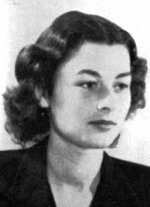 Violette Szabo in particular was much written-of after the war (long out of print, the classic Carve Her Name With Pride was recently republished), and was posthumously awarded a variety of decorations by both England and France. Szabo has what looks to be a charming museum in Herefordshire (phone ahead to Miss Rigby before visiting! ); for a younger generation, she’s the inspiration behind “Violette Summers”, the protagonist of the video game Velvet Assassin.